The Chauvet SlimPAR Quad 12 IRC is a low profile, high-power LED PAR designed for any application where wash lights are needed. Twelve quad-color (RGBA) LEDs make this the perfect front light by eliminating multi-color shadows and providing a smooth, even output. The addition of the IRC (Infrared Remote Control) allows simple operation and eliminates the hassle of programming. With a 100% convection cooling system, there is no fan noise to distract the audience. Considering purchasing the Chauvet SlimPAR Quad 12 IRC? Have questions? Ask people who've recently bought one. Do you own the Chauvet SlimPAR Quad 12 IRC? Why not write a review based on your experience with it. this product is great you can use it practically anywhere and performs well. A very bright, versatile light. It is perfect for uplighting and makes great colours!! 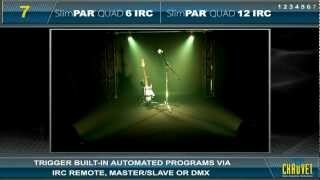 Seen a video for Chauvet SlimPAR Quad 12 IRC online or have you own video? You will earn 520 loyalty points with this product worth £1.30, when logged in. 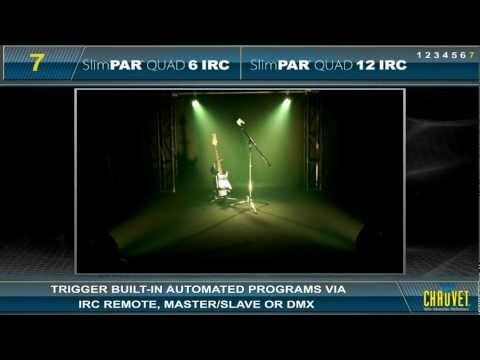 Check out Chauvet SlimPAR Quad 12 IRC on DJkit.com!